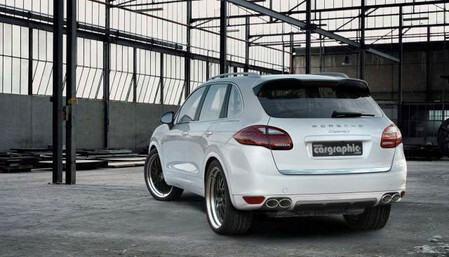 German tuner Cargraphic has announced their upgrade program for the new Porsche Cayenne Turbo. The hybrid Cayenne comes with a sophisticated powertrain with nearly 400 hp, but Cargraphic says that thanks to their new exhausts system and electronics refinement, they can extract a few more horses out of it. Apart form that, they will also style your car with a new body kit specially made for the Cayenne II, 22-inch wheels and lowered suspension. This is to make the Hybrid a bit cooler!